BounceForwardVR is dedicated to discovering how to activate the deep human potential that fear in people and in organizations blocks by combining, 360 immersive experiences with activities to regenerate resilience lost to stress, depression and a sense of despair. Humans have a super intelligence that is bypassed in lieu of shortcut solutions, quick external fixes. Anxiety is treated as a disease rather than an expression of a need to act, to respond to the call for action that is in alignment with your personal contribution. Humanity faces wicked problems like poverty, environmental overdraft threatening food and energy security, economic disparity… the list goes on. Tackling those problems will take everyone working together to transcend the challenge of bias, beliefs on what is possible – it will take engaging the power of the human spirit in and beyond the workplace. Take depression which costs the global economy $1 trillion dollars per year according to UN figures. Depression is treated as a weakness when biologically it signals repression of expression. From an energy point of view, when someone is not connected to their deep potential and an inspiring sense of purpose, one of two things can happen. The energy goes inward (depression) or blasts outward (aggression). 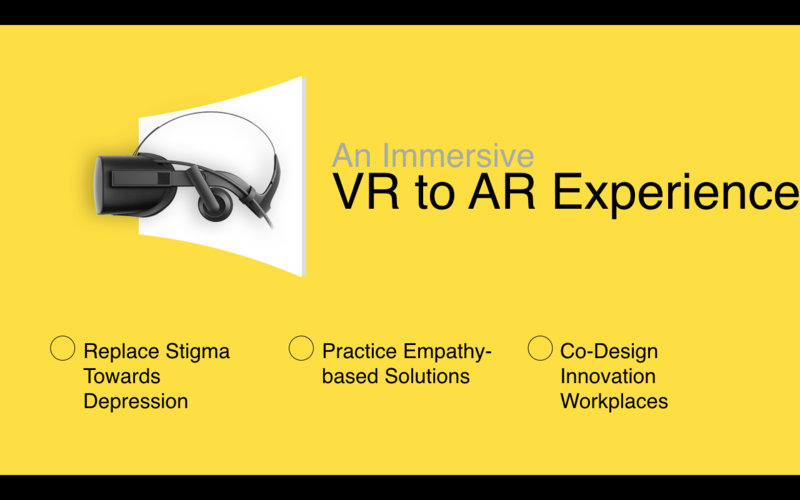 BounceForwardVR – 360 Immersive to remove stigma to depression in the workplace and restore health to the individual and to the workplace environment. To see the pitch deck please message me. Open to collaboration and of course, financial help.